I often say that my favorite dessert, hands down, is something hot apple with caramel and ice cream. At a fancy restaurant, there's usually the decadent, impossibly rich chocolate thing, there's the carrot cake thing, there's the cheesecake thing, maybe a key lime thing, and then there's my favorite of all, the hot apple thing with the caramel sauce. It can be anything from a crisp to a cobbler to a deep dish pie, and I'll choose it every time. So, of course, when my brother Denny asked me if I wanted a bag of apples, I was all too happy to accept. I knew there would be something deliciously apple in my near future! But what should I make? I've already shared so many wonderful apple recipes, but I wanted to make something new. So I looked up a few things, read several recipes, checked a few cooking web sites, and finally found what I wanted! This recipe is about as easy as it gets, and it uses simple ingredients that you probably already have in your well-stocked pantry. It's the perfect Autumn dessert! Serve it warm right out of the oven. Beat together sugar, oil, cinnamon, and vanilla. Add eggs one at a time, beating well after each addition. Sift together the flour, baking powder, and salt. Mix in the milk and sifted dry ingredients, stirring just until blended. Gently stir in apples. Pour apple cake batter into a greased 9-inch square pan. Bake until cake springs back when tapped lightly in the center, about 30 to 40 minutes. With a fork, pierce cake all over. Pour hot caramel sauce over cake. Serve it as is, with a dollop of sweetened whipped cream or whipped topping or better yet, a scoop of vanilla ice cream! Combine brown sugar, butter, and cream in a heavy saucepan over medium heat; bring to a boil. Reduce heat to a simmer; continue cooking and stirring for 5 minutes. Remove from heat and stir in vanilla. Pour hot caramel topping over hot apple cake. --The caramel sauce is SO yummy. It would easily double as an ice cream topping. It has a slightly different flavor from the real Home Made Caramel Sauce and it's slightly thinner, but it's still to die for! --You can certainly serve this right in the pan as directed, but I think it's a better presentation to serve it on a cake platter or pedestal. Just let it cool for about 10 minutes after taking it out of the oven, then turn it out onto a cake rack, then onto your serving platter. Then go ahead and pierce the cake with a fork and drizzle with caramel sauce. It's a much nice presentation, don't you think? 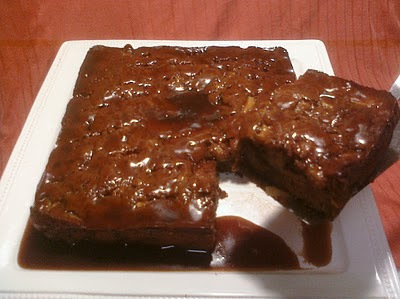 -- I doubled the amount of caramel sauce, because, well, I like caramel sauce, and more is more. -- If you're nuts for nuts, then go ahead and sprinkle your drizzled cake with chopped pecans, or walnuts, or peanuts, or whichever nuts drive you nuts. -- I toyed with the idea of increasing the ingredient amounts by half and baking it in a 9x13 pan, just for the sake of baking a larger cake. I think it would work but you'd probably wind up with a slightly thicker cake. If you decide to try the larger pan, be sure to let me know how it turns out, k? --Don't try to do this in an 8" square pan. The cake fills a 9" pan all the way up, so an 8" pan would clearly be too small.